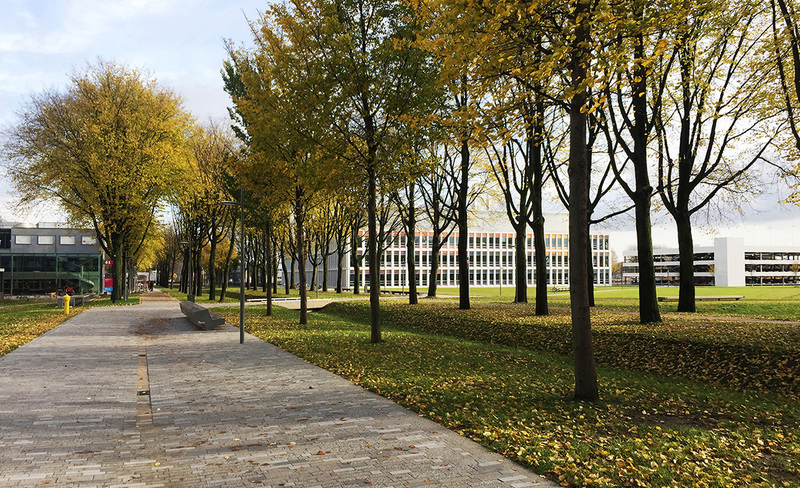 In the summer the Kluyverweg on the TU Delft Campus has been transformed into the Kluyver Park. 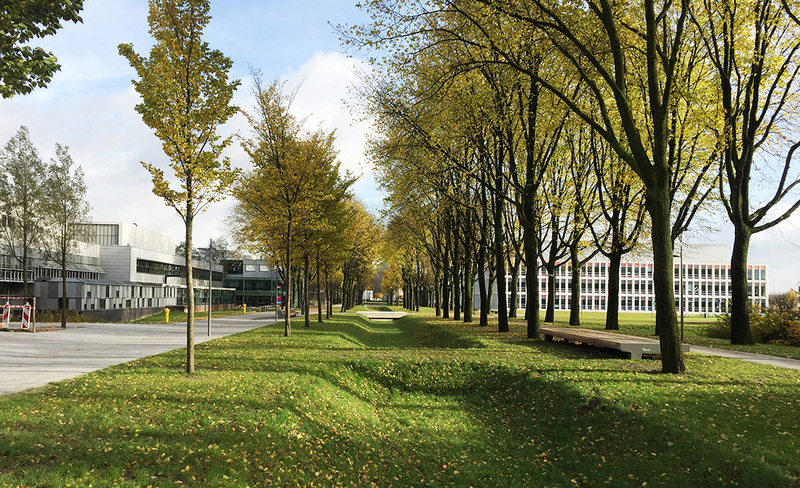 The Kluyver Park is the new heart of the southern part of the campus which connects the various faculties. Motorized traffic has given way to a shared space for pedestrians and cyclists. Located at the heart of this area of campus, the park is the future place where students, teachers and other users can relax, take a walk and meet each other. The preservation of the imposing tree structure along the former Kluyverweg serves as the main starting point for the design. The four double rows of elm trees form a binding element on a large scale and give the Kluyver Park its allure. The rows of trees give structure and atmosphere to the large park terrain and also offer shade. The park’s green appearance is based on the underlying polder landscape. The treeline matches the polder’s character: long lines emphasise the area’s horizontality. In addition, the main landscape ingredients of the Kluyver Park are flowering grass banks, water elements and an expansive view. The Kluyver Park and its immediate surroundings are decorated according to the shared space principle, where pedestrians and cyclists share the paved outdoor area with each other. 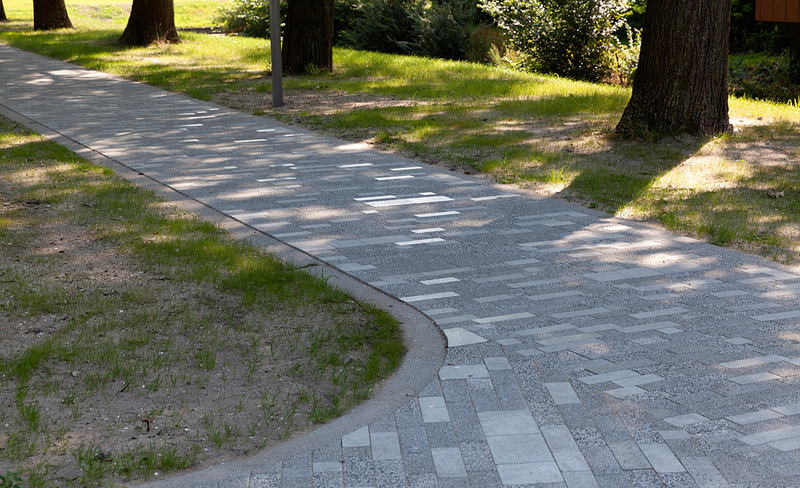 The pathway pattern is based on the anticipated pedestrian and bike paths that mutually connect the buildings in a logical way. Before the entrances, the paths widen into squares. 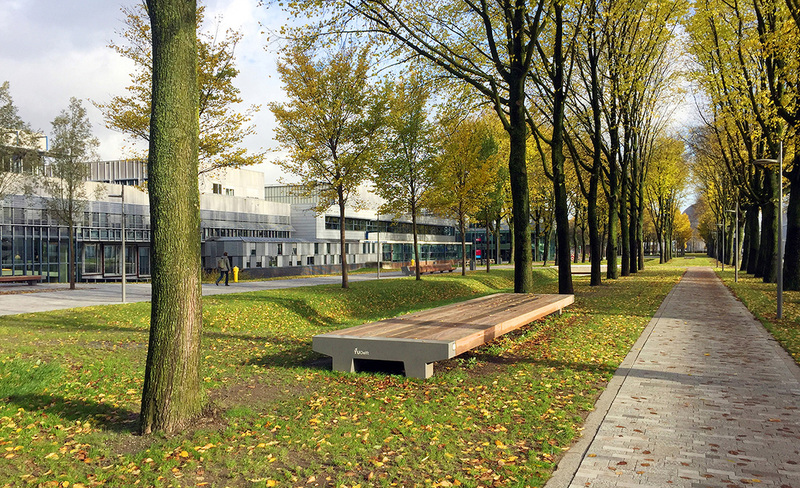 The entrance squares are designed as meeting and work places within the public space with beautiful clusters of trees and special seating installations. The paving of the shared space and entrance squares constitutes a recognisable unit and consists of grey, concrete paving stones with a top layer of different shades and finishes. This pavement provides a distinctive streetscape that, through the texture variation in the top layer, still has the informal atmosphere of a park. The buildings’ entrance areas are designed as meeting and work places in the public space with beautiful clusters of trees and special seating installations. In addition to solid wooden benches and tables, this area also contains freely movable chairs. The chairs can be arranged freely and animate the use of the entrance squares. Wadis have been built in the park for sustainable rain water circulation and infiltration. In order to create good connections between the faculty buildings, bridges have been built over the wadis. The Kluyver Park can accommodate different types of plants and animals. The herbal vegetation, banks and ditches play an important role in this. These structures allow ecological exchange (dry and wet) to occur. In addition, waterways have been constructed around the new faculty building for Applied Sciences (AS). By connecting these green and blue spatial functions to each other, an intricate ecological network is created. 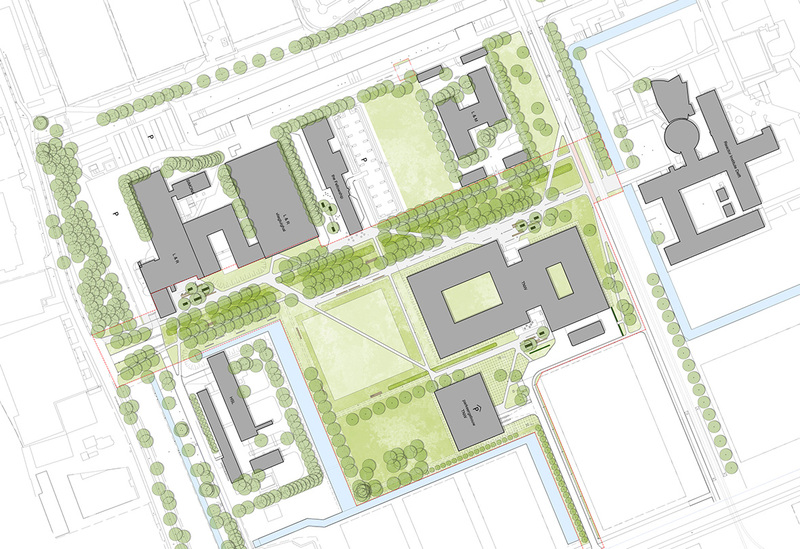 The Kluyver Park is the first project on the campus that follows the design principles of the TU Delft Campus Vision and the karres+brands designed Public Space Toolbox. The implementation of these design principles shapes the campus living principle.